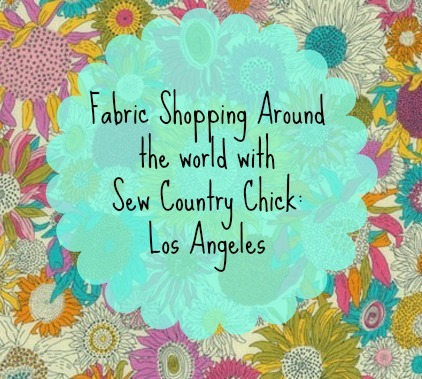 I have been shopping for fabric in downtown Los Angeles since I was a student it FIDM years ago. Unlike most neighborhoods in LA which are always being revamped, this little slice of the downtown area hasn’t changed much. 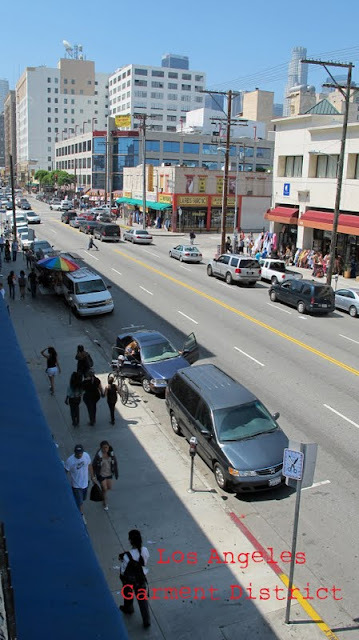 It’s bordered bordered by “Skid Row, a rundown area on the north, which has been cleaned up a bit by the new loft boom , industrial warehouses to the east, the Staples Center to the west, and the low budget knock off shopping district known as “The Alley” on it’s southwest side. You can find the fabric district on South 9th Street between Wall and Maple streets. Small shops spill of into the surrounding streets that fall in between Maple and Wall. They have the best hot dogs in the world there. 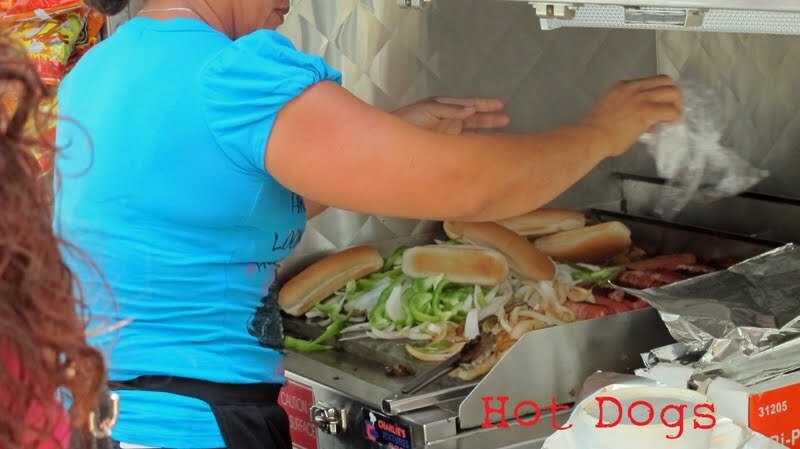 Street vendors wrap them with bacon, grill them, and top them with grilled onions and peppers, adding a flourish of avocado salsa mixture topped with mayonnaise and ketchup. It alone almost makes the drive there worth it, AND the hot dogs are only three dollars. If you have never been downtown you should start here. It’s more expensive than the small shops but it is huge and has an exhaustive selection of fabrics, trims, notions, and knitting supplies. There is also a well stocked home decorating branch across the street. 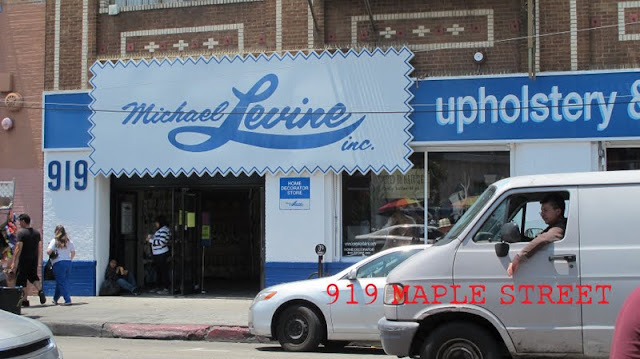 Although more expensive than most shops downtown, you can find top quality dress and home decorating fabrics at Micheal Levine and it is still less expensive than the pricier fabric stores like Mood and International House Of Silks and woolens on the pricier westside of LA. A little further South on 9th Street are some amazingly well stocked trim shops. If you don’t shop with a list it can be overwhelming and your head can start spinning while taking in all the beautiful and exciting trims. 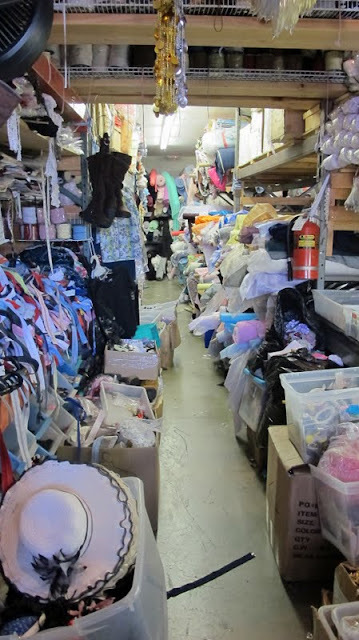 A giant bargain basement with dress, home fabrics, notions, and trims. I can remember getting home once from a trip downtown and realizing I had forgotten to buy an item I had gone for, having instead been seduced and sidetracked by other more colorful and interesting prospects. Zippers, flowers, studded trims, feathered trims, jeweled trims, laces, beads, velvets, colored hooks and eyes, grommeted trims. It’s like being a kid in a candy store! I would advise you bring your list. Another place to stop when you are in the area is the Scholarship store of FIDM. 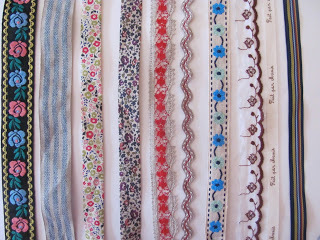 Some beautiful fabrics and trims can be found there for one to two dollars a yard. I bought about 25 yards of some beautiful delicate lace trim for only six dollars once. 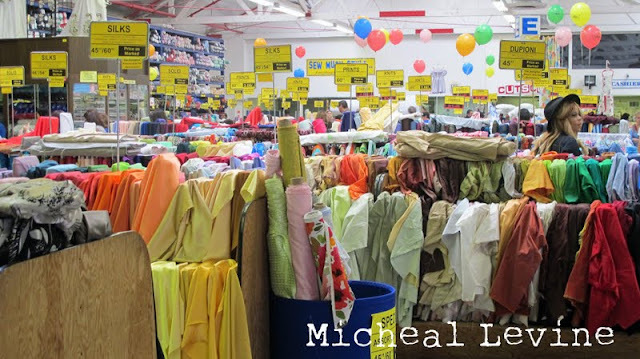 Like most bargain fabric stores in the downtown area, shopping there is hit or miss. Manufacturers in the area donate their unused fabrics to FIDM and the sales go to support the Scholarship fund there. At FIDM, there is also a wonderful bookstore,and a small but interesting fashion museum on the premises. Some of their displays in the past have been costumes from Mad Men, and Tim Burtons’ Alice in Wonderland. On my last visit, there was an exhibit titled “Breakfast At Tiffany’s and The Little Black Dress”. All stocked up on fabric and we also bought a balloon gun! Don’t forget to buy a fruit paleta when you visit. I bought Sandia this time, or watermelon. These country chicks had a great day. To be honest I grew up ten minutes away from downtown. 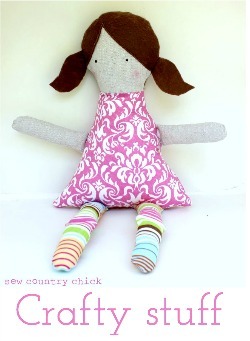 But it’s an exciting day for the mini country chicks who don’t go to the city very often. 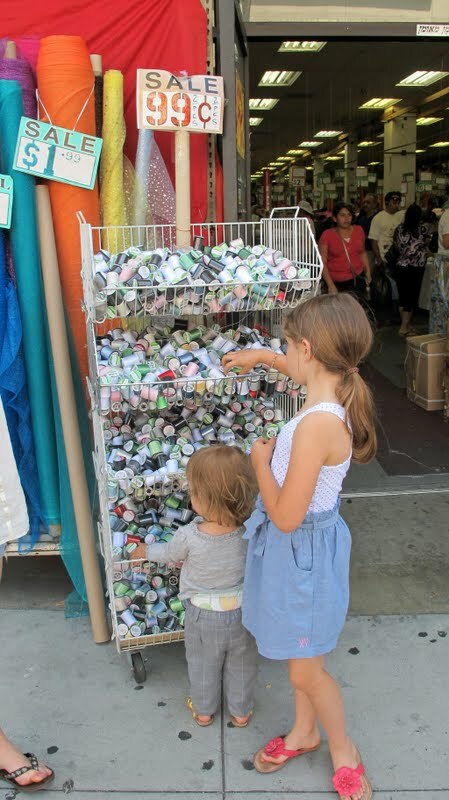 Usually we go to Little Tokyo or Olvera Street nearby after I am done shopping to eat even more ethnic goodies or to buy much coveted Japanese school supplies. Fabric Shopping Around The Globe: Downtown Los Angeles Shopping for fabric trim in Paris Los Angeles Fabric District Field Trip Shopping The World For Fabric, Paris! Thank you so much for this! I’ve been wanting to go down to the garment district for a while, but wasn’t quite sure how to do it. Oh WOW, what I would give to be able to spend a day in a garment district. I am in awe just looking at your photos. Nothing like this in Orlando. This post is so useful1 one day when I visit L.A I wanna go there. Thanks so much. I live in New Zealand and save posts like this – and when I get over there I will go!!!! Thanks again! I just posted a link on the Sew Weekly Circle because Gretchen was asking about fabric resources in different cities around the world. Thanks for the info! Arghhhh!!!! I wish I had known about this area a little while back when travelling with my husband. I think I would have liked LA a bit more then too. 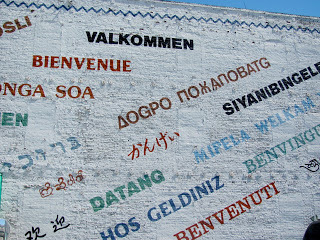 Thanks for sharing this and if I ever get the chance to go back, I will definitely go there. There are areas like that over here London too. Such fun browsing, haggling and buying far too much!!!! Yes LA is a confusing city because it doesn’t really have a center and things are so far apart. Public transport is also bad for visitors. I *love* Michael Levine! And, I love that they have validated parking for those times when I want to just zip in and out (like for a bolt of muslin…). And, I like that I know what I’m getting whereas it can be questionable in other shops. 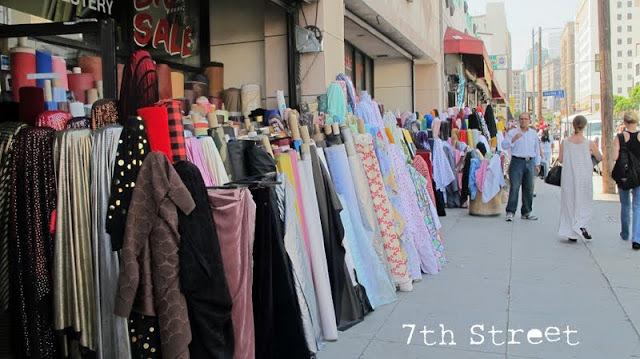 We just took our Pasadena City College Intro to Fashion students on a field trip to the garment district the other day so that they could get a feel for what is available. 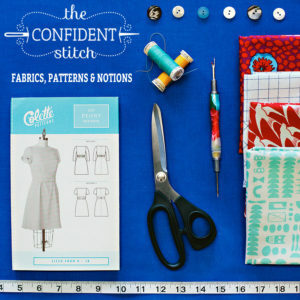 It can be a bit overwhelming and you are so right about really bad fabric being right next to the fine fabric. I just found your blog via the Burdastyle Vionnet post. 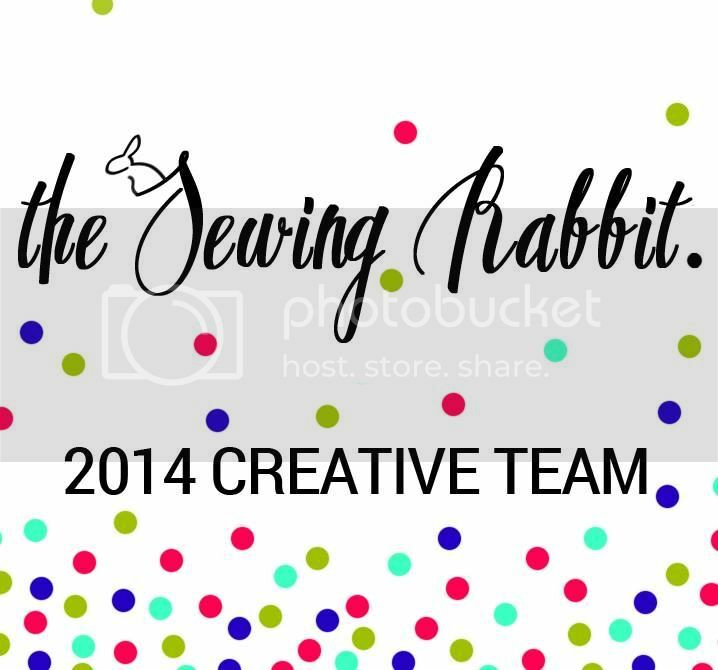 I’m a current FIDM student (a professional designation student) starting my 4th quarter and wondered if you had any advice for making the most of the school and its resources. I’m doing well, but I find that they try to get you in and out as fast as possible without much academic / career counseling and I feel I haven’t be taught as much as I should. I remember the job placement was pretty good.maybe it’s changed or because of the move to Asia for the factories, there are less jobs available. There were a lot of internships available when I was there and they set up some interviews for me. It is a bit of a money mill,I agree. 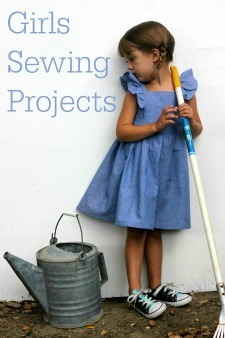 I wasn’t the best at sewing when I was there and wished I had started off a better sewer so my designs would have looked more professional. I felt rushed through as well. I wish I had gone to Otis instead . 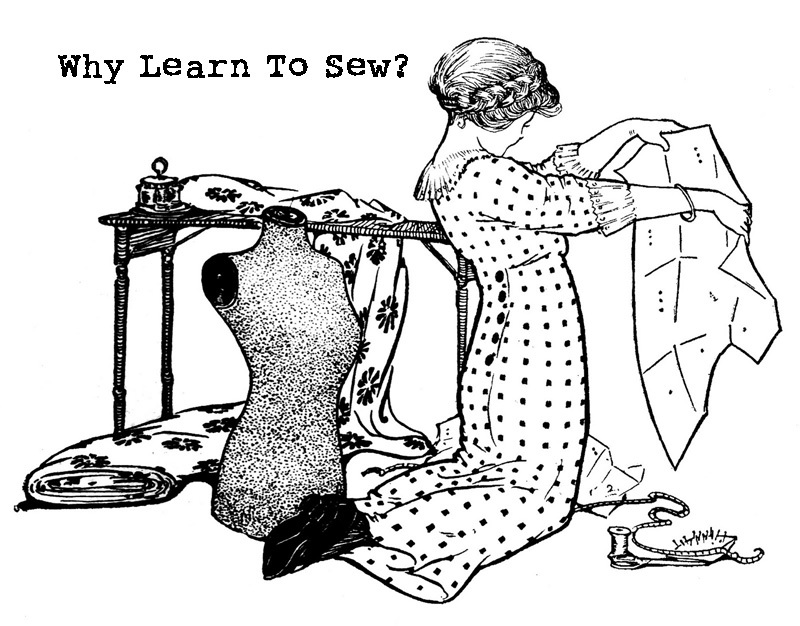 But the draping and pattern making were great. I had Ms.Amaden Crawford and Helen Armstrong for pattern making and an elderly gentlemen of the old Hollywood couture for draping. He must have retired a long time ago. Keep bugging them in the job counseling center. Persistence pays off ! 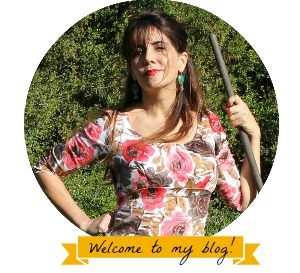 I’m going to check out your blog now. Great post! I tried going to the garment district once when I lived in LA for a semester but the tiny streets and lack of parking were so overwhelming I never even got out of my car! Do you have advice for parking? Are there any good side streets? Is it worth it to park in a garage? I’m going back to LA on vacay and I really want to stop by the garment district for real this time and visit some of your recommendations! Thanks so much for the suggestions. 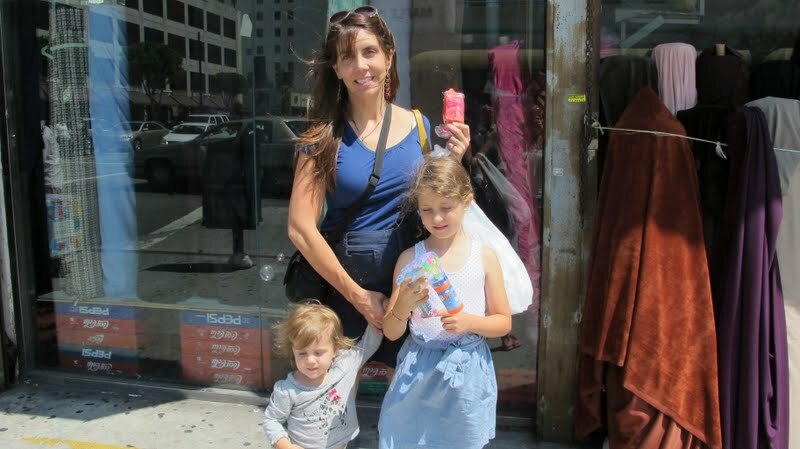 I live in LA but have never been shopping in the fashion district, mainly because I’m scared of the crowds. 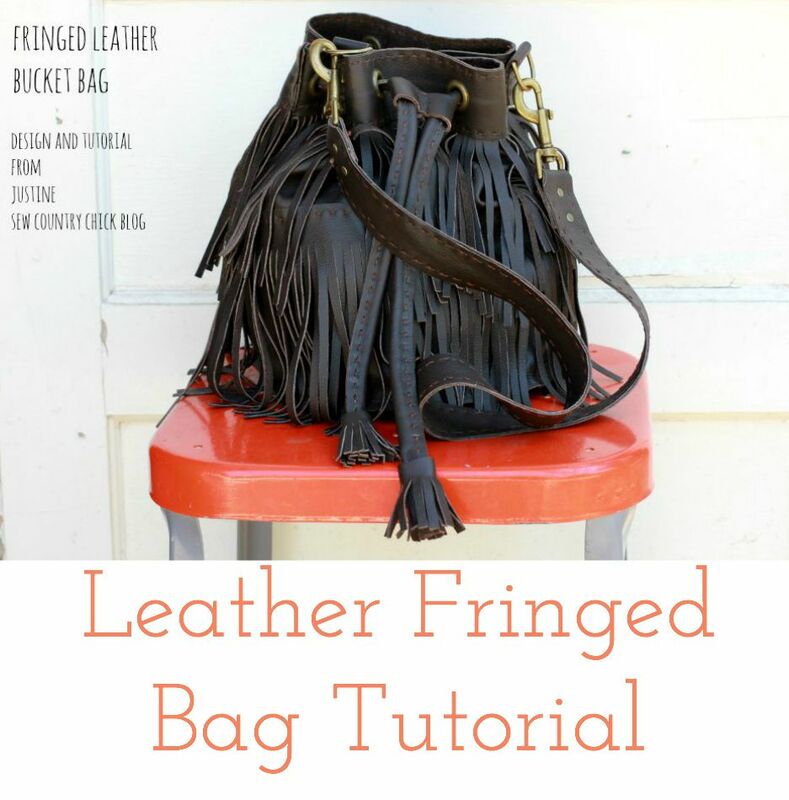 Do you have any suggestions for cheap stores with brocades and taffetas? I’m also afraid of the stores being super-unorganized and not being able to find what I want. Thanks! 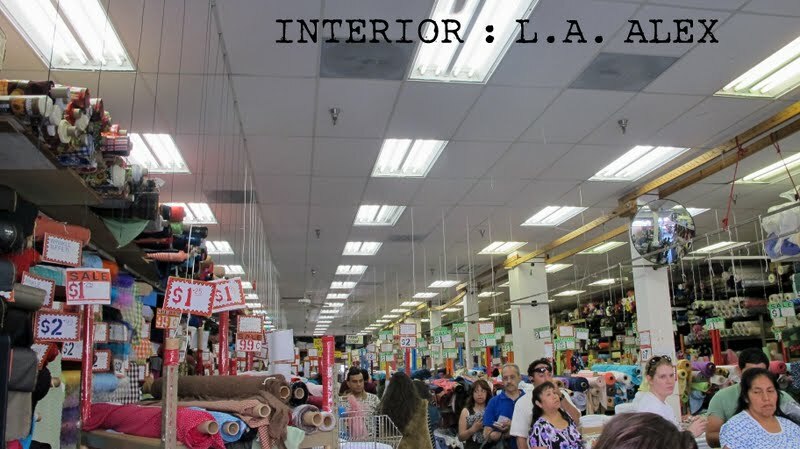 I’ve been down there a few times but I hadn’t even heard of the FIDM or L.A. Alex stores! I need to head down there to help make my cousins wedding beautiful. Where is the best parking spot for the specific stores you mentioned above? Thanks for the tips! I need to head to those specific store soon. Where is the best place to park? tex city have the best silk in down town. Great article. I’m visiting California from the Midwest. 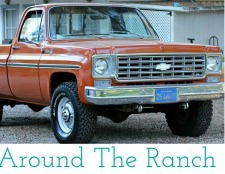 You write in this article, “If you have never been to downtown…”. Now I guess you are referring to those who live in the LA area. Are there Californians who live around LA who have never been to downtown?? I’m taken back by this. Thanks.